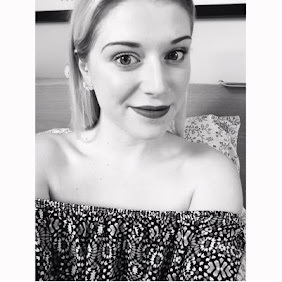 Jewellery I feel is usually overlooked when it comes to holiday shopping or maybe that's just me as I tend to think about clothes and shoes and that is as far as my brain will stretch and I also tend to wear the same pieces and never really think about buying more in case I don't wear them! 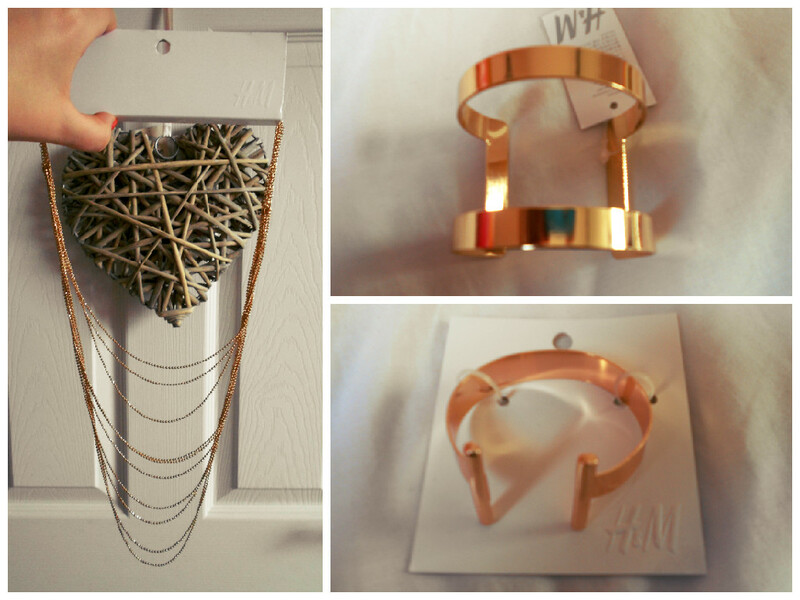 But since this is a special holiday I thought I would buy some new pieces to go with my new outfits! 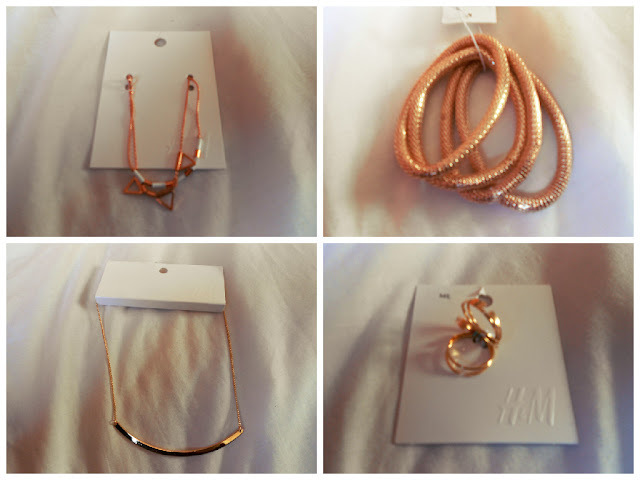 I got all my pieces from H&M and they were so affordable! Luckily though I have the most generous boyfriend and he offered to pay for them (I had payed for some new t-shirts for him so it evened out haha). All of the pieces I got were £3.99 each apart from one necklace which was £7.99 which I thought was so good and I really love the colours, I mostly got rose gold and some gold pieces so here they are! 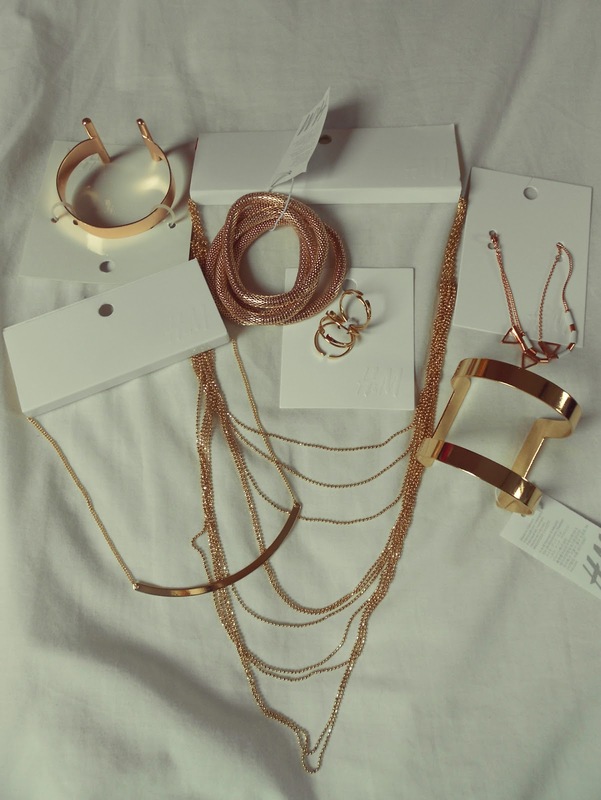 I got 2 cuff bracelets, 2 necklaces, a 4 pack of rose gold bracelets, an anklet and some rings! They are all so lovely and my favourite piece is definitely the long multi-chain necklace as it is so pretty and will make outfits a bit more elegant! Sorry for the horrendous quality of the pictures my camera was having a right mare and would not focus or do anything I told it so I kind of gave up but you get the general feel that they are all rose gold pieces of jewellery! 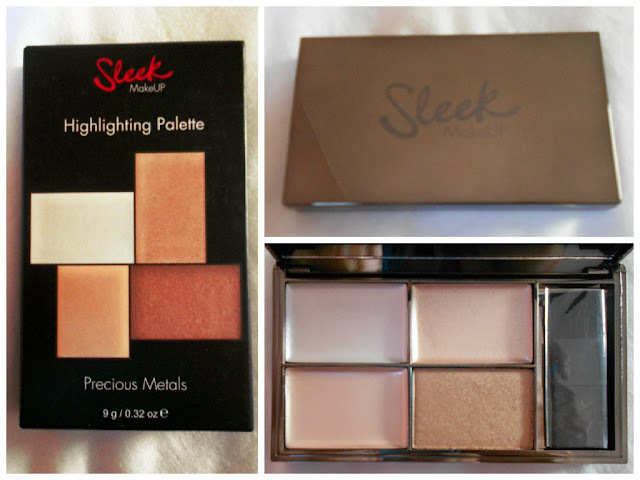 I also ordered the new sleek precious metals highlighting palette from boots! The packaging is AMAZING its so shiny and beautiful and the colours in the palette are to die for, I am very excited to use it on holiday! Also on Thursday I went to get my nails done ready for holiday and I am so impressed with them they look beautiful, if you follow my Instagram I put up a picture (it is a lot better quality again sorry!) I got a shellac manicure with OPI varnish and I chose the colour Toucan which is a lovely orange/red and will hopefully make me look extra tanned, fingers crossed! The lady who did them at my local beauty clinic Visage was very professional and made me feel very comfortable, turns out she was also going to Tunisia next week! But the clinic itself was very clean and welcoming so if you're in the Tavistock area I cannot recommend them enough! What are your favourite holiday jewellery staples?! 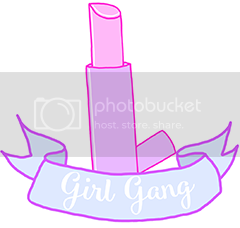 My sister is down in Devon for the weekend for her best friends hen do so tonight we are having a BBQ which I am very looking forward too! Hope everyone is having a fantastic day!